U.S. House Speaker John A. Boehner’s retirement could create an opportunity for at least two Texas Republicans — U.S. Reps. Pete Sessions and Jeb Hensarling, both of Dallas — to become national party leaders. WASHINGTON — U.S. House Speaker John A. Boehner’s retirement could create an opportunity for at least two Texans to emerge as national party leaders. 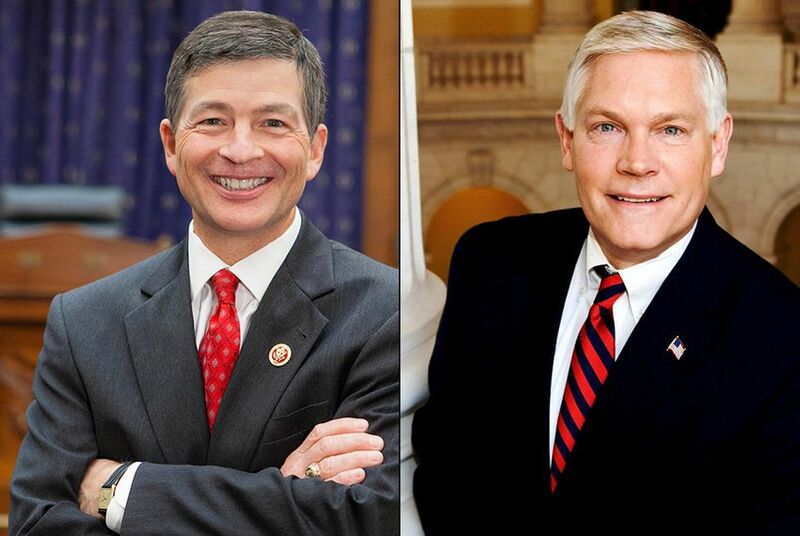 Upon Boehner’s retirement announcement Friday morning, U.S. Rep. Jeb Hensarling emerged as a possible contender to replace the speaker, while U.S. Rep. Pete Sessions could run for House Majority Leader. Both men are from Dallas. It is not likely that either would have an easy path, should either man run. U.S. House Majority Leader Kevin McCarthy of California, a workhorse who prodigiously built interpersonal relationships among his colleagues, was instantly the prohibitive favorite to succeed Boehner. And the race to replace McCarthy in the number two slot could be crowded and nasty. But most Texans who compete in Republican House politics are taken seriously, as long as it is apparent they have consolidated the state delegation behind their campaigns. One in ten House Republicans come from Texas. The 25-member GOP delegation is one of the most powerful voting blocs in the House — if it sticks together. Boehner revealed his decision to his colleagues early Friday morning, ahead of the last votes of the week. Members walked to the House floor in shock, many visibly upset with his decision. Others, conservative firebrands, could not hide their glee. But mostly, Republican members were stonily silent. When a reporter asked U.S. Reps. Bill Flores, R-Bryan, and Randy Neugebauer, R-Lubbock, if they wanted to comment on the news, they replied in unison: "Not really." It was not immediately apparent whether Hensarling, currently the House Financial Services Committee chairman, was actively advocating for the speakership or any other leadership position. Hensarling walked to the House floor after the Boehner announcement looking straight ahead and politely declined to answer questions. "To my knowledge, Jeb has the answer to that question," said U.S. Rep Kevin Brady, R-The Woodlands, of Hensarling's future. "Even though it's early, I’m supporting Kevin McCarthy." On the floor, a row of Texas Republicans — U.S. Reps. John Culberson of Houston, Kay Granger of Fort Worth, John Carter of Round Rock, Randy Weber of Friendswood, and Sam Johnson of Richardson — sat together as the members around them whirred with gossip and asked for loyalty pledges. Granger, in particular, was a focal point of interest for many members. While not overt in her influence, she is a behind-the-scenes power broker in House Republican politics and no matter where she roamed on the floor, members approached her. Instead of bolting for the airport to head home after Friday votes, the Texas delegation met privately in a room usually reserved for the House Rules Committee, which is chaired by Sessions. Sessions represents wealthy parts of Dallas that are important to Republicans running for federal office. He served as head of the House Republican’s campaign committee, an elected position, during the 2010 and 2012 cycles. The 2010 term was particularly important, because Sessions helped elect dozens of new Republicans to Congress — many of them now in position to vote on new leadership. And he has sought a spot in the leadership before — against the man currently favored to succeed Boehner. Sessions ran against McCarthy for majority leader after U.S. Rep. Eric Cantor lost his primary in 2014. But after a few days, Sessions withdrew from that race. One by one, Texas members silently exited that meeting, with grim faces and most declined reporters’ questions. "These things move fast," said U.S. Rep. Blake Farenthold, R-Corpus Christi. "By sunset today, the field will be set." U.S. Rep. Louie Gohmert, R-Tyler, a chief Boehner antagonist, also weighed in. When asked if he was considering running for speaker after his disorganized attempt to oust Boehner in January, Gohmert laughed. “No,” he said. "When I ran, I knew I was making so many people mad there'd be no chance of being elected to anything. So no." After the meeting, Hensarling didn’t rule out a run. “Chairman Hensarling is considering his options, and I expect he will have a decision by early next week,” a spokeswoman emailed Friday afternoon. Beyond that statement, many GOP insiders were doubtful that Hensarling would follow through on a leadership run. But if he does, he could pose an interesting contrast to McCarthy. Boehner praised McCarthy in a Friday news conference and there's little evidence that the problems that dogged Boehner would be resolved in a McCarthy regime. Hensarling, meanwhile, is considered an ideologue on free market values, but he also plays well enough among Republicans that he earned the chairmanship of one of the most powerful House committees.